"I suggested that a police peacekeeping mission should be considered." Former Ukrainian President Viktor Yanukovych has admitted to asking his Russian counterpart Vladimir Putin to send troops to Ukraine in 2014. Speaking at a news conference in Moscow on 2 March, he described it as a "police peacekeeping mission". "I did not write a letter to Putin, I wrote an address to Putin. The same one as I wrote in Donetsk on 22 February to three states signatories to the peace agreement, who guaranteed the signing of the peace agreement. I wrote a similar letter to Vladimir Vladimirovich Putin. The only difference was that in this letter and this address I did not refer to the peace agreement signed with the three guarantors from the three European states, I referred to the agreement on friendship and mutual assistance between Ukraine and Russia. And I suggested holding consultations on the provisions of this agreement. I suggested that a police peacekeeping mission should be considered during these consultations," he said. Later he said that this decision was to be ratified by the parliaments of Ukraine and Russia. However, since consultations did not take place, Russia simply "informed the international community through the UN, through its ambassador [Vitaliy] Churkin". "But this my statement was of a purely informative nature and was never used otherwise," he added. The Russian news agency RBC published photocopies of Yanukovych's address and statements. On 28 November 2016, Yanukovych was declared a suspect in the high treason case. 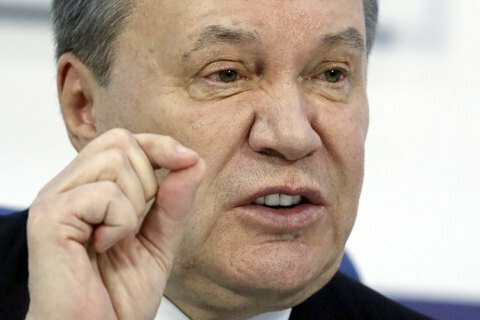 He is suspected of committing high treason, while staying in Russia on 1 March 2014, by addressing President Putin with a written request to use Russian troops in Ukrainian territory. According to Ukrainian Prosecutor-General Yuriy Lutsenko, as a result, Ukraine lost Crimea and state property worth over 1,070bn hryvnyas there.